It's A Bird! It's A Plane! It's The Superman Festival! It’s A Bird! It’s A Plane! It’s The Superman Festival! Down in the southern tip of Illinois is the hamlet of Metropolis, the official home of none other than Superman. Once a year the town pulls out all the stops to celebrate the beloved character. 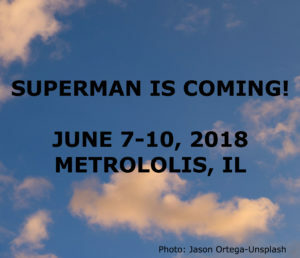 This year’s 40th Annual Superman Celebration will be June 7-10, 2018. The four-day fest, sponsored by the Metropolis Chamber of Commerce, features a range of activities for all ages, including a fun run, carnival, bike ride, helicopter rides, life music and more. Celebrities from Superman comics, TV shows, and movies will also make an appearance. This year’s lineup includes actors John Haymes Newton, who played the role of a teenage Clark Kent as well as Superboy in the 1988 series; Aaron Smolinki, who at age three was baby Superman and also starred in Superman: II and Superman: III; and Jeff East, an East St. Louis native who portrayed a teenage Clark Kent in 1978’s Superman: The Movie. Several notable cartoonists will be on hand too, including Jon Pinto, Charles D. Moisant, and Daniel Peretti. Check the Superman Festival website for a full listing of events. While you’re heading down to the festival, enjoy a day or two in the beautiful Shawnee Hills. The area is known for its great hiking and numerous wineries, and there are several wonderful bed and breakfasts in the area, including Country Schemes B&B in Vienna—and it’s even located on Metropolis Road! Country Schemes B&B is a member of the Illinois Bed and Breakfast Association … a unique lodging experience! This entry was posted in Festival, Illinois Bed and Breakfasts, Illinois town of interest, Special event and tagged Festivals and events, Illinois Bed & Breakfasts, Illinois towns, Shawnee Hills National Forest by admin. Bookmark the permalink.